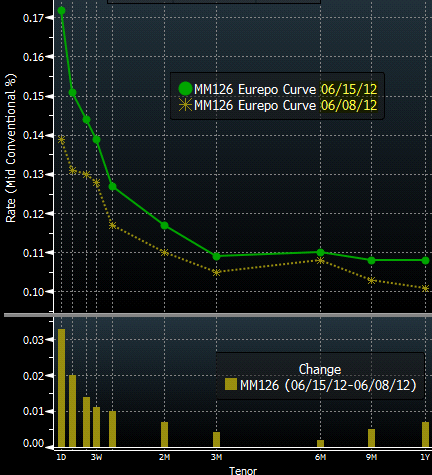 The Eurepo rates have risen in the past week (ht Kostas Kalevras) with the curve becoming even more inverted. This is likely an indication of further flight of deposit capital out of periphery nations (possibly out of the Eurozone altogether) ahead of the Greek elections, as banks look to replace lost deposits in the secured funding markets. The preference continues to be in the overnight funding because banks do not want to lock up collateral for longer periods. This is an indication that liquidity conditions in the Eurozone are becoming tight once again and another round of LTRO funding from the ECB this summer may be in the cards.